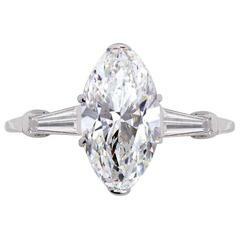 This Certified GIA F-IF 5.39 Carat Diamond Platinum Engagement Ring is no longer available. 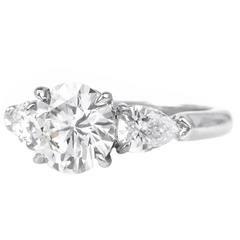 This Breathtaking diamond engagement ring is crafted in solid platinum. 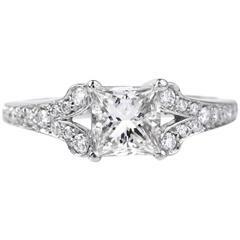 It Centered 5.09 carats F color , IF (Internally flawless) clarity, emerald-cut diamond with very good proportions , GIA certified set in a classic platinum mounting . This exrra ordinirey diamond is flanked by two tapered baguette diamonds of approx 0.30 carats total weight, graded G-F color, and VS1 clarity. 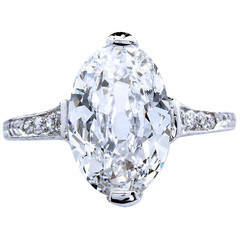 This conspicuous engagement ring of alluring aesthetic remains in excellent condition. Weight is approx: 3.5 Grams Ring Measurement: 12mm wide x 7mm High Ring Size is approx: 5.5 (sizable) Accompanied with a GIA certificate A professional Appraisal Document accompanies this item.